Slotland Casino is a very nice casino with a great online layout providing amazing services to all of there cliental, bot PC and MAC users. If you are really into playing slots, than Slotland is where you want to be as you might be able to tell from the name. Slotland opened their virtual doors in 1998, making it one of the older and more established internet casinos. Slotland uses its own propriety software that was designed and created specifically for Slotland. 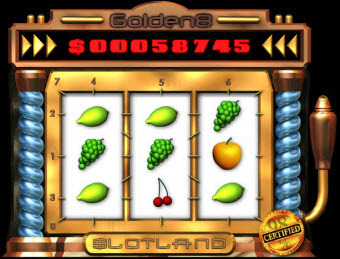 You will find some of the classic casino card and table games, but, as mentioned before, Slotland is really all about being a land full of slots for you to explore. Because Slotland uses their own proprietary software, you will find that it has an attention to detail that you might not find at other online casinos. Plus since the software was designed specifically for Slotland, as soon as you enter the internet casino it will be like a breath of fresh air as you won’t find yourself stuck looking at the same software you find at many online casinos. Another great thing about creating their own software is that they were able to choose to create both a PC friendly and a MAC friendly software to allow all players to play at Slotland Online Casino. On top of both of those ways to play at Slotland, they also have a mobile Slotland application that you can play right from your phone. 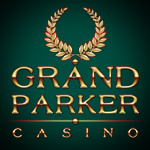 The graphics provided are top of the line and crystal clear and the sound effects will make you feel as if you are in a real life brick and mortar casino. Of course, one of the benefits to playing at an online casino is that you can mute the noise and play in peace. All of Slotland’s games feed through the same progressive jackpot which continues to grow and grow until someone wins it! This jackpot usually gets hit every 40 days or so and is on average around $80,000 although the amount will vary depending on how many people have been playing and how many days have gone since it was last won. 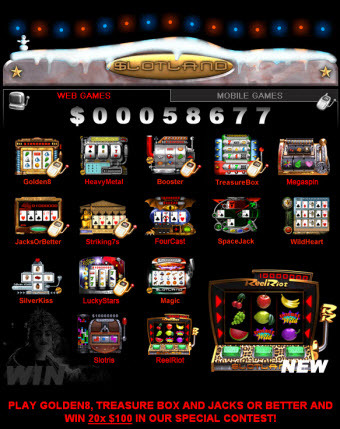 Being as Slotland has “slot” right in their name, you can expect to find an amazing amount of fun and exciting slot machine games to choose from such as; Golden 8, Heavy Metal, Booster, Treasure Box, Magic, Striking 7’s, Space Jack, Lucky Stars, Silver Kiss. 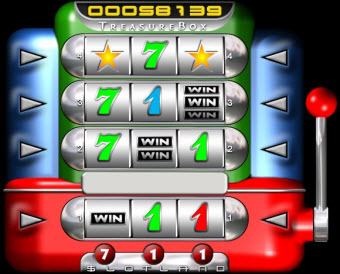 Of the mentioned slot machine games, 2 of those are available via Mobile Slotland, Lucky Stars and Golden 8, so that means that you can play them right from your mobile web. All of the above mentioned slots are MAC friendly slots and available on both the download and the instant play softwares. 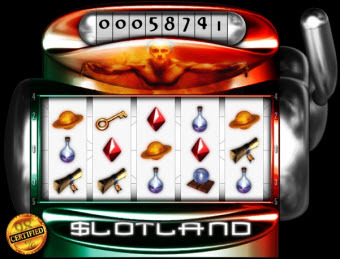 Another game that is available on both the download and the no download casino software is Slotland’s signature game, Slotris. 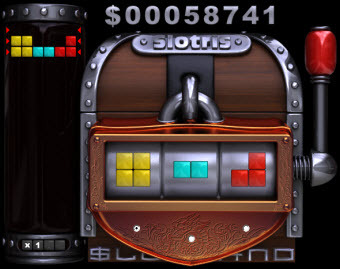 Slotris is a really fun slot machine game to play if you love Tetris and you love slots, you are sure to love Slotris as it is a combination of the two. Although slots are the main games available at Slotland, as mentioned before, you will also find many of your favorite classic casino games available including but not limited to; Blackjack, Video Poker, Craps, Caribbean stud and so forth! Each of the games has its own set of rules and such so do be aware to check them out before game play! Before you can start playing at Slotland casino, no matter which software you use, if you want to play for real money, you will need to make a deposit into your real money casino player account. When you make your first, deposit, Slotland welcomes you with a 100% match welcome bonus of up to $100. A 100% match bonus means that for every dollar you deposit over 10 dollars, slot land will match you dollar for dollar up to 100 dollars! Plus, if you invite some of your friends to come play with you at Slotland Casino and they deposit and let Slotland know that you referred them, you and your friend will get $20 free! There is no limit to how many friends you can invite to play with you at Slotland, the more the merrier as they say. Another great promotion is their weekly drawings for free cash. Each Wednesday, Slotland will randomly draw a name of a Slotland Casino player who will win 500 casino dollars. Then, they will draw 9 more names and each of those 9 players will win 100 in casino dollars. After that, they will draw 10 final names and those final 10 players will be awarded 10 casino dollars. Along with all of the great promotions mentioned above, they also have a Slotland VIP club and it is their pleasure to award their loyal customers with extra cash! The VIP program has many different levels for their players and the more you play, the higher the level you will be on. As you progress through the levels, you will notice that you are not only earning your points quicker, but there are even more prizes and tournament opportunities available of you. Slotland has some of the best and friendliest representatives around the online web, and all of the representatives are there to assist you in the quickest way possible. There are two different ways to contact a representative, email and phone. The great thing about the email service is you can usually expect a response within 5 minutes all depending on how busy they are. However, if you are not wanting to email back and forth to get your problem solved, you can always pick up the phone and give one of Slotland’s friendly and knowledgeable customer support team members a call. The phone option has the quickest response time as you are connected with a customer service representative right away and since it is a live person they are able to walk you through to your solution step by step.